Freedom Alliance was pleased to help the Knights of Columbus in sponsoring a reception for Father Luke Dundon on June 12, 2011. On that day, Father Dundon celebrated his first Mass as a priest at St. Timothy Catholic Church in Chantilly, Virginia. After he fulfills a three year commitment to the Diocese of Arlington, Virginia, Father Dundon will minister to the young men and women of our military as a Navy Chaplain. Our congratulations go out to Father Dundon, but more importantly, he has our thanks for choosing to serve both God and Country. His first Mass was a beautiful celebration and the church was filled to capacity. After Mass, was a reception hosted by Freedom Alliance and the Knights of Columbus. Several hundred parishioners came out and took photos with Father Luke and received a blessing from him. Luke Dundon was born at Bethesda Naval Hospital in 1981, the oldest of four children in a military family. While he was still a child, his family spent three years in Spain with the U.S. Navy. When the family returned to the U.S., they lived in Arlington, Virginia, where Luke attended Bishop O’Connell High School. He graduated in 1999, and entered the U.S. Naval Academy. He was commissioned with a Bachelor’s degree in Physics in 2003 and was assigned to the submarine service in 2005. During the interim, he was stationed at Pearl Harbor to conduct graduate studies in physics and astronomy, where he earned his Masters Degree. In 2005, as Luke was preparing to return for nuclear power training, he received word from the Navy that he would be released from active duty in Submarines due to prior illness and medical history. While a shock, Luke soon came to realize that he had already been thinking more about a religious vocation and began to inquire about seminary and the Chaplain Corps of the Navy. 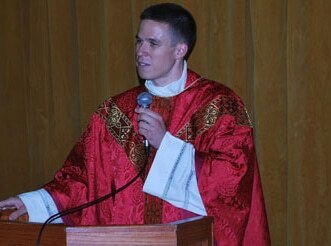 Luke attended Mount St. Mary’s Seminary in Emmitsburg, Maryland and was ordained to the priesthood on June 11, 2011. Father Luke has been assigned to St. Phillip parish in Falls Church, Virginia, and in 2014 he will begin his work as a Navy Chaplain.